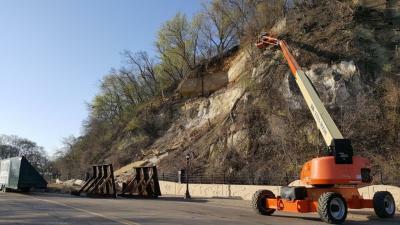 On Monday, April 30, Saint Paul Public Works began an assessment of the Wabasha Bluff and surrounding area where a slope failure occurred on Saturday afternoon, April 28. 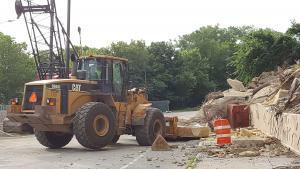 Large pieces of rock debris from the bluff were scattered across Wabasha Street prompting the city to close the street and evaluate the conditi​on of the bluff. There were no injuries or damage to private property. City of Saint Paul reopened Wabasha Street to vehicles and pedestrians at 3:30 p.m. on Wednesday, October 24. Saint Paul Public Works will schedule a mill and overlay on this stretch of Wabasha Street for next year. Ward 2 Councilmember Noecker will be working with the neighborhood to propose aesthetic improvements as part of a future-year capital project request. Rain put a damper on road repair work this week. In anticipation of the inclement weather, the contractor (Urban Companies) placed aggregate between the road and new gabion wall (instead of common dirt backfill) to help the site to quickly dry-out and allow contractors the ability to restore the base materials for the new concrete sidewalk and curb. City bridge maintenance continues to clean and paint the ornamental railing south of the project. City electricians coordinated with Urban Companies to relocate street lighting conduit and lantern-style light post bases. Concrete sidewalk will be formed and poured tomorrow (Saturday, October 13). Like Bolander, Urban Companies has been responsive to the city’s desire to maintain the project schedule and provided Saturday work. Concrete curb and bituminous patching is scheduled for next week. The city and contractor have been coordinating with the NeDA community group to accommodate a public art installation on the north end of the project. We remain on schedule for re-opening Wabasha Street mid-November. 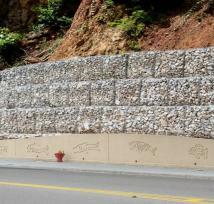 On Friday, September 28, crews completed the gabion wall system that will protect Wabasha Street from potential future rock slide threats. A second contractor will arrive on site on Monday, October 1, to perform necessary road repairs. Sections of curb and pavement will be removed, realigned, and replaced. Concrete sidewalk and grass boulevards will be reconstructed on the west side of Wabasha Street. Road repair work will be completed in early November. Following these final repairs, the road will be re-striped and opened to traffic. Public Works received a request to partially re-open the road to single lane vehicle travel during upcoming road repairs. The contractor requires the full road width to safely perform road and curb repair work. Therefore, the road must remain fully closed. Please be assured that Public Works will open Wabasha Street to traffic as soon as possible. Contractors are underway building the gabion wall. Please click here for pictures and detailed description of the construction process. 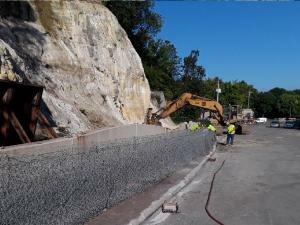 Last week, the city began work with its contractors to construct the gabion wall system that will protect Wabasha Street from potential future rock slide threats. This week, contractors are assembling and placing wire baskets, filling them with limestone riprap, and securing them to form a barrier that can resist impact and dissipate energy from a rock fall. Wall construction will continue through September. The city publicly advertised for bids to repair the roadway. 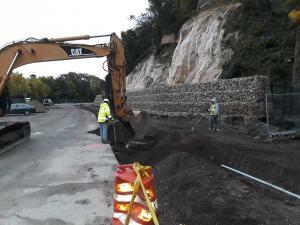 This work will follow gabion wall construction and is necessary to re-open Wabasha Street to all traffic. Ward 2 Councilmember Rebecca Noecker is committed to working with the neighborhood to propose aesthetic improvements as part of a future-year capital project request. Once the road re-opens, the city will engage local residents and businesses in this next step. 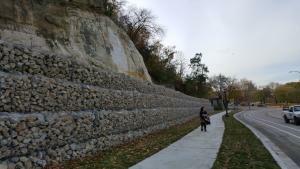 Apologies for a longer lapse in reporting the progress on the Wabasha Bluffs. The first phase of the removal of loose material and fallen debris from the bluff and clean up took longer than expected. The proposed gabion wall system (rock-filled wire baskets) was planned to be placed behind the existing sidewalk and small concrete retaining wall. 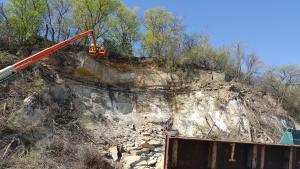 As the debris was removed from the bluff and cleared out behind the existing small retaining wall, it was discovered that the underlying sandstone was deteriorated and unreliable. For safety reasons, contractors could not start construction of the gabion wall system at the originally planned location. After additional site and engineering reviews, the plan was revised slightly. The gabion wall will be built; however, it must be built on the existing sidewalk in front of the small concrete wall. This allows the gabion wall to be built on a more stable foundation of city-owned right-of-way. With the new site plan (click here to see drawing), Wabasha Street will continue to be a two-way street with sidewalks on both sides of the street, as well as bike lanes. Construction of the gabion wall is expected to begin in September and be completed in October. Road repairs, including rebuilding curb and sidewalks, will occur after the gabion wall is completed. Currently, we anticipate Wabasha Street to be re-opened in late November. The final road repair will be a bituminous mill and overlay in spring 2019. 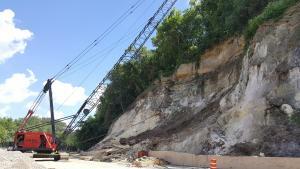 Contractor crews are cleaning loose and fallen debris from the bluff. Rock materials are being hauled from the site. These materials are brought to facilities where they are re-purposed or sorted, crushed, and re-used in construction. 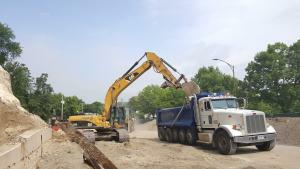 As the removal of debris exposes rock and soil surfaces progresses, the city continues to review site conditions with contractors and consultants. The next step in the construction of the gabion wall system will be to excavate and provide a compacted base for the wall to be built upon. Contractor erected a crane to assist with debris removal and gabion wall construction. Consultants finished and validated the technical design of the gabion wall system with site survey and exposed slope conditions. City crews removed and salvaged railings and street lights to provide access necessary for debris removals. Construction testing agency installed equipment to monitor and manage construction vibration. Contractor established access routes through the site and started to remove loose debris from the slope. The city has approved construction of a 250' long gabion wall along the Wabasha Bluff in order to safely reopen Wabasha Street. The finished gabion wall is expected to be 12' tall and 9' wide. 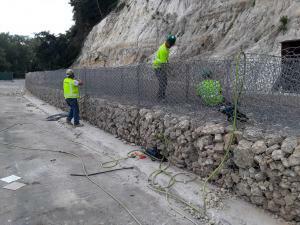 Construction of the gabion wall will protect the public and the roadway from natural erosion of the bluff without the risk of further destabilizing the bluff or drastically impacting adjacent properties. Preparations to begin construction will start immediately with full construction likely to commence the week of June 25, 2018. Construction of the wall, along with street repairs and cleanup, is estimated to take 12-weeks. The estimated total cost of the Wabasha Bluff project, including consultants, construction of the wall, street repairs, and clean up is $1.1 million. Below is a rendering of the wall. Itasca Engineering will provide additional requested engineering and cost estimates to the city. The city will continue area clean up efforts. Itasca Engineering inspected one additional rock feature from the private property at the top of the bluff. Itasca Engineering presented recommendation(s) to city officials. The city has requested additional engineering work and cost estimates before approving a final action plan. That work is expected to be completed next week. Itasca Engineering inspected the bluff from the private property at the top area which was inaccessible from the Wabasha Street level. City and Itasca Engineering coordinated with contractors regarding access and means and methods for removal of limestone blocks being considered for short-term actions. City coordinated with property owners to author license agreements. City of Saint Paul secured permission from a private property owner to enter the property to conduct additional assessment work from the top of the bluff. City of Saint Paul is finalizing access agreements from neighboring properties. Public Works is developing costs and timelines for potential remediation options to present to the mayor and city officials in the coming 2-weeks. Public Works held a media briefing to share consultant's data and findings, along with some "working recommendations" needed in order to reopen Wabasha Street. City staff completed records research and validated site survey data generated by the consultant, Itasca Engineering. Itasca Engineering presented preliminary assessment findings to city officials. Itasca Engineering began to develop potential remediation options. City staff developed a communications plan and procedure to keep local businesses and residents most affected by the slope failure and the resulting road closure informed. 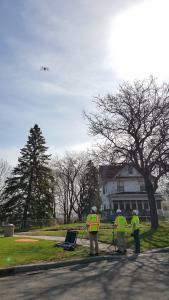 Contractors developed a system to monitor the bluff and installed associated survey equipment next to Wabasha Street. Contractors completed the initial field inspection of the bluff. Geologists are analyzing the field records, in conjunction with survey data, to assess bluff stability. Contractors are developing a series of alternative recommendations to be presented to city officials next week. 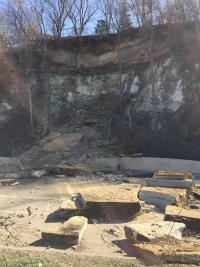 Contractors continue to do assessments and inspections of the bluff. A full report and recommendations from the contractors are expected within a few weeks. A second consulting firm, Collins Engineering, performed a detailed aerial survey of the failed slope and adjacent bluff. Three-dimensional geospatial data was collected using drone technology. Large lift equipment allowed experts to do hands-on observations and assessments. Public Works and contractors installed several large pieces of equipment to allow crews to safely operate within the site and protect the streets, property, and persons should any loose debris fall from the bluff during this process. A pedestrian and bike pathway was opened on the east side of Wabasha Street. As of Wednesday, October 24, 2018, Wabasha Street has reopened for vehicle traffic.